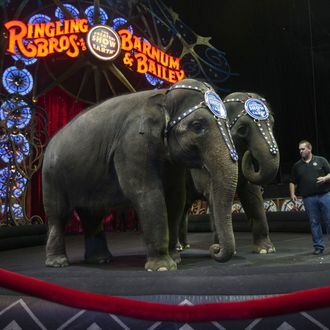 On Monday, the Ringling Bros. and Barnum & Bailey Circus announced that it will be retiring its elephants this May, almost two years earlier than previously planned. Last March, after local governments began passing “anti-elephant” and “anti-circus” ordinances, the circus said it would phase out its 13 remaining Asian-elephant performers by 2018. Since P.T. Barnum imported his first elephant 133 years ago, animal-cruelty laws, not to mention public perception of what constitutes humane treatment, have changed drastically, leading to Ringling’s decision. The retired pachyderms will be moved to the Center for Elephant Conservation, a 200-acre retirement community that now houses 46 elephants who have already hung up their boots. Because elephants have a very low cancer rate, researchers will be doing DNA testing on the retired herd in the service of medical research.
.@RinglingBros is retiring their elephants-- the circus will never be the same.